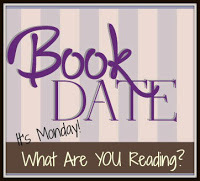 Book By Book: It's Monday 5/21! What Are You Reading? It's Monday 5/21! What Are You Reading? After a very busy, hectic week that left me wiped out, we got some news that sent us into a family crisis. There was nothing to do over the weekend but wait in limbo until that the powers that be can decide our fate this week. So, that all led to a very stressful, exhausting weekend with a lot of disrupted sleep (but still a lot to get done at home). Fingers crossed it will all work out this week, but we just don't know yet. I did something I almost never do - set a book aside without finishing it. I read a little past halfway of Fates & Furies by Lauren Groff for one of my book groups and threw in the towel when I realized I wouldn't be able to make it to the meeting (which ended up getting cancelled). I was just not enjoying this novel. The concept is intriguing - the story of a marriage told first from the husband's perspective and then from the wife's - but the characters were unlikable, the narrative style was really strange, filled with lots of sentence fragments and a distanced feel that made it hard to feel anything for the story or characters. Turns out most of the group didn't like it, so I was in good company! I picked up my next review book, The Possible World by Liesl O'Halloran Schwarz, which I am totally immersed in and loving - what a relief after forcing myself to slog through Fates & Furies! This is the intertwined stories of three people: a six-year old boy named Ben who witnesses a horrific mass murder at his friend's birthday party and loses his memory, an ER doctor named Lucy who takes care of Ben when he is first brought in and wants to help him, and across town, Clare, who will be turning 100 soon and finally decides to share her life story - including long-held secrets - with a new friend. It's just what I needed - hard to put down and engrossing. On audio, I finished The Great Alone by Kristin Hannah, and it was excellent and compelling. It starts in 1974, with a 13-year old girl as the main character, about a family that moves to Alaska. The husband/father was a POW in Vietnam and is clearly suffering from PTSD (though that diagnosis didn't exist back then) and moves the family to a remote cabin in Alaska impulsively. Things go well at first (it was summer! ), but once winter begins, his mental condition deteriorates rapidly. Since he is at times abusive, parts of the book are difficult to listen to, but it's a moving, immersive, and powerful story. For a complete switch to a lighter story, I am now listening to Deadzone, book 2 in the Horizons middle-grade series. This is one of those series with a different renowned author for each book, and this second book was written by Jennifer Nielsen. It's good so far, action-packed, suspenseful, and twisty, like its predecessor. It's about a group of kids who are the sole survivors of a plane crash that went down in the Arctic, but they find themselves in a strange alien-like landscape filled with unique (and dangerous) flora and fauna. My husband, Ken, is reading The Troop by Nick Cutter, a thriller I gave to my dad as a gift that was among the many books we inherited from him when he died three years ago. Ken and I both love reading his old books because he shared our love of reading, and it makes him feel close. I have heard this one is a bit gruesome, but my dad loved it. Ken confirmed that last night when he said, "This is good, but I don't think you'll want to read it!" I'm guessing that our son, Jamie, 23, is still reading the Wheel of Time series by Robert Jordan. He is on book 7, A Crown of Swords, but without much reading time. Graduation is this week, and things have been difficult for him recently. Summary of Books Read in April - it was a late spring but a great reading month for me! Oh, dear! I hope things work out for the best for you and your family. Come see my week here. Happy reading! Thanks, Kathy - it's been a tough few days. We should hear something tomorrow. Oh I'm so glad you enjoyed The Possible World after forcing yourself through something you didn't enjoy. What relief! Sometimes I wish Goodreads had a good option for a "do not read" list. lol I'm also adding The Great Alone to my TBR list. It sounds very good! I'm glad you get to read the books your father once enjoyed. I inherited some of my dad's books when he passed away unexpectedly and my son has already dove into that pile. I'm looking forward to starting one of his favorite series soon. Thanks for sharing and have a wonderful reading week, Sue! Yeah, I knew that one had mixed reviews when it came out, but I gave it a try for the book group! Glad you have that connection with your dad, too. I miss him so much - reading his books makes him feel a little closer! Would you say that The Great Alone is more of an adult book, even though the main character is 13? I'm looking for books set during this time period, but this one seems pretty heavy. 100% adult book - definitely not for kids. It deals with some very tough stuff - domestic abuse, PTSD, and more. As for kids' books set in the 70's, do you have Sunny Side Up and Swing It, Sunny? Both excellent middle-grade graphic novels set in the 70's, and the second one especially highlights that 70's vibe perfectly! I'm so sorry for your crisis, hoping it will work out for you and your family, Sue. I wondered about the Kristin Hannah since I just read Nightingale & loved it. And thanks for sharing about Fates & Furies, will not consider it. I have enjoyed all of the Hannah novels I've read. Firefly Lane had me sobbing - 3 times! Hope you like The Great Alone - it's a good one and delves into some really important issues, too. Sorry to hear about the stress in your life. Hope things work out for you and your family. I really enjoyed Deadzone and thought that Jennifer Nielsen really raised the creepiness factor in that book which is going to be really good for the readers of that series. I have been debating picking up the third. Yes, it's great so far! Just gets weirder and weirder! I think I already have #3 on audio (I have quite an audio backlog!). Sorry things have been difficult. Hopefully this week will be less stressful. I’m glad you liked The Great Alone. I’m on a waitlist for it and should be getting it soon. Thanks, AJ. The Great Alone was excellent - hope you like it, too! Love your review of Refugee--such a special book! Yes, it is! I want to spread the word! I hope the news you get this week is good or at least gives you some relief with knowledge. I am proud of you for walking away from a bad book; it's such a difficult thing to do, but just needs to happen sometimes! We are good, Helen - nothing has been easy for my son with his illnesses, but things are on for this weekend, so that's a relief. Thank you!! I so rarely don't finish a book, but I feel like I did the right thing with this one...especially since the next one I picked up was so great! Sue, I am keeping my fingers crossed very tightly for your family. I'll be thinking of you and hoping all goes well. So much love to you. Glad you liked the Great Alone -- I did too. I've had Fates & Furies on my list for a long time. Maybe I'll just pass. Hope you are settling a bit after your family news. It's funny because I really liked Groff's first book, Arcadia. Yes, things are settling down a bit here - gearing up for the big graduation weekend now. Thanks! Oh-oh. I hope the news you get is good tomorrow. Keeping you in my prayers. The author Groff's first book was one I set aside after reading a bit. I don't often do that so I felt better about myself knowing you did the same thing for her next book. Thanks, Anne - we are fine and graduation is moving forward, so that's the important thing. Not an ideal resolution but one we can live with. Now it's time to celebrate! Funny, I really LIKED Arcadia! But Fates & Furies was entirely different with a very weird narrative style. The book that I am reading is lovely and well-written and I really am liking it, but I feel that I am still slogging through it, mainly because it's such a chunkster, and I think I need a dedicated time to really read through it rather than snippets here and there: it's cutting for stone by Abraham Verghese. And I just don't have blocks of time to really just sit down and read through it. Hopefully, soonest. Ah, yes...Cutting for Stone. You described it perfectly! It is a wonderful book but definitely a long read. It's Monday 5/14! What Are You Reading? It's Monday 5/7! What Are You Reading?